Are you looking for a high end fifth wheel that promises comfort wherever you go? Look no further than the gorgeous RiverStone. 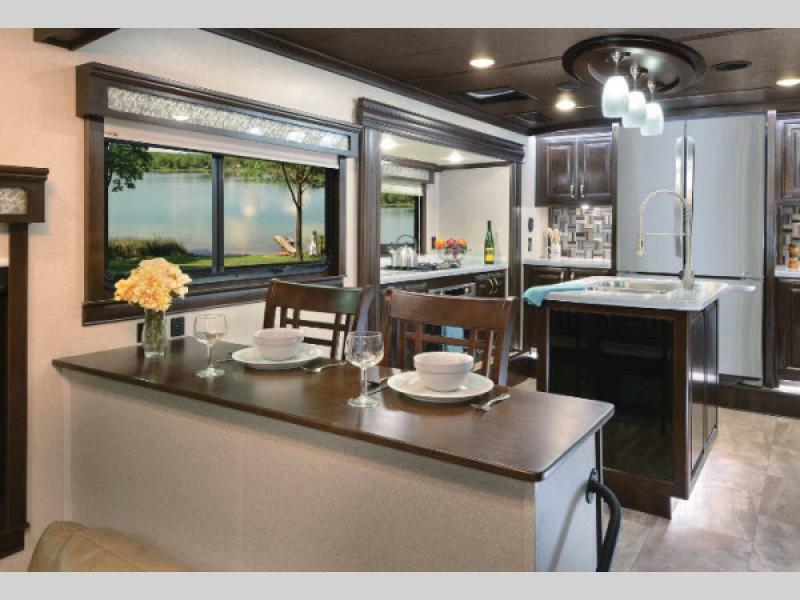 In our RiverStone fifth wheel review we look at what sets this RV apart from the competition and three features that we know you will like. A comfortable bedroom is an important part of enjoying your RV vacation. You will absolutely love how RiverStone doesn’t skimp on details. From the plush memory foam mattress to the spacious storage to the lovely fireplace, everything about this bedroom screams comfort, rest, and relaxation. If you enjoying cooking delicious meals for the entire family, then look no further than the gorgeous kitchen found in every RiverStone floorplan. 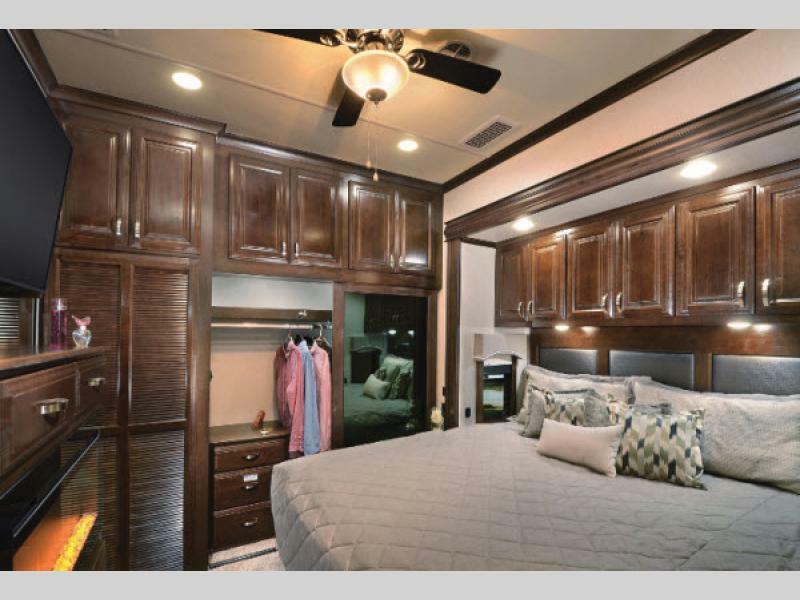 From the stunning appliances that provide a residential experience to tons of storage to attractive decor, you’ll love every minute spent in this RV. And on those days that you just don’t feel like cooking you will love having everything needed to quickly heat up leftovers or carry out right at your fingertips. 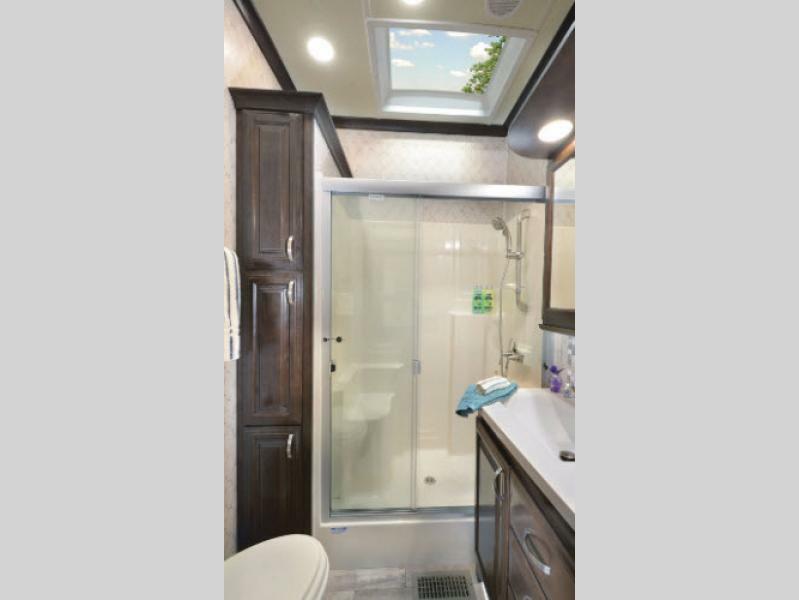 One of the most common complaints of RVers is that the bathroom is too small. Not so with RiverStone. These bathrooms are chock full of features. You’ll love the huge shower and ample storage under the sink and the linen closet. Every minute spent in this RV will feel like home. If you’re interested in learning more about our selection of RiverStone fifth wheels for sale, contact us. We can answer any questions you have and make sure you’ve got the information needed to make the best decision for your needs. We can also assist with RV financing.